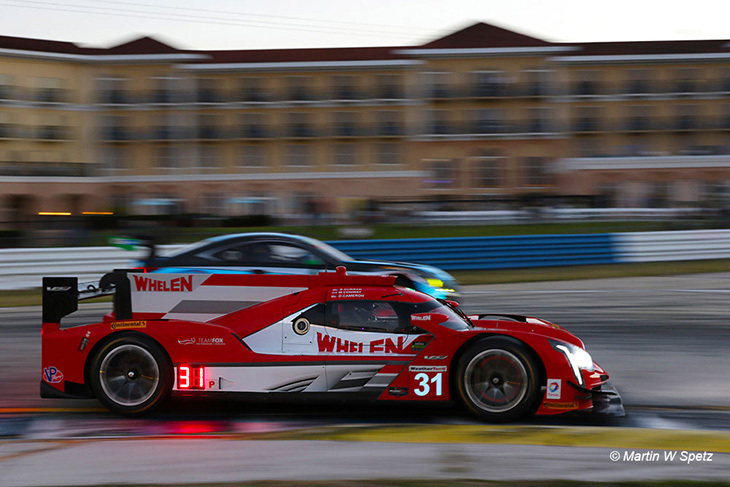 Wayne Taylor Racing continued its fine form from Daytona back in January, winning the 65th running of the Sebring 12 Hours yesterday. 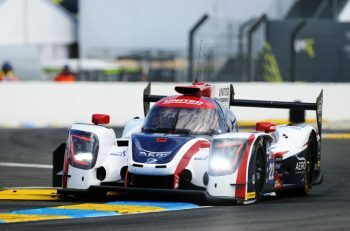 Jordan and Ricky Taylor, joined by IMSA debutant Alex Lynn, stormed to victory in the team’s Cadillac DPi V.R after Jordan took the lead with just under three hours to go, getting by Filipe Albuquerque’s #5 Action Express Cadillac DPi at the final corner. Albuquerque, along with Christian Fittipaldi ended up crossing the line 13.6 seconds behind the winning Caddy, and two laps clear of the sister Whelen-Liveried Action Express DPi V.R of Dane Cameron, Eric Curran and Mike Conway. It was another show of force for the new Cadillac prototype, which has so far gone unbeaten in IMSA competition this season. It likely would have been a three-way battle for the lead to the flag between the three Cadillacs, but Curran and, Cameron and Conway’s chances of winning was ruined in the first half of the race when a costly spin while leading after colliding with the #22 ESM Nissan DPi – which was heading for the pits – forced the team to send the car behind the wall, losing it two laps. In the end though, the race was still thrilling, with lots of green flag running, only six cautions and an incredible display of driving by the podium sitters. 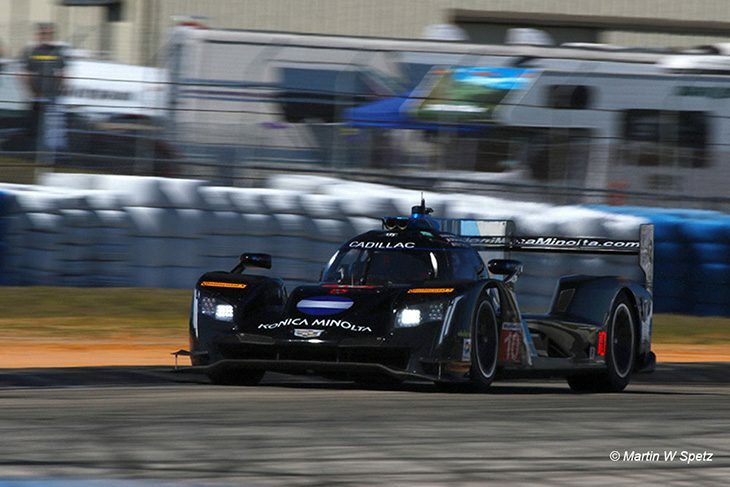 The Cadillac does appear to be best of the bunch when assessing the performances of the other chassis in the race, because behind, it was a classic race of attrition in Florida. 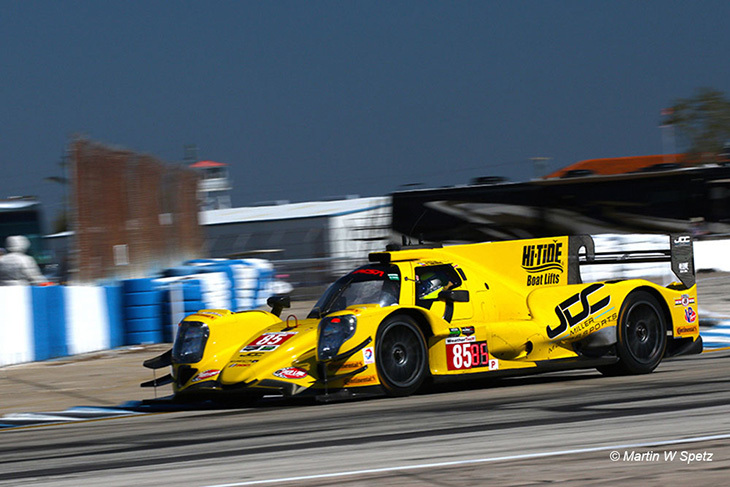 Finishing fourth overall was the JDC Miller Oreca which showed pace in the pre-Qualifying running, but ended up finishing four laps down, posing little threat to the GM-runners. It was also the only other Prototype-class that finished in the top 20. Both Mazda’s crossed the line at the end, but after multiple issues, including the #70 of Tom Long, Joel Miller and Marino Franchitti which had a sizeable incident on the entry to the final corner and lost a ton of time due to repairs. 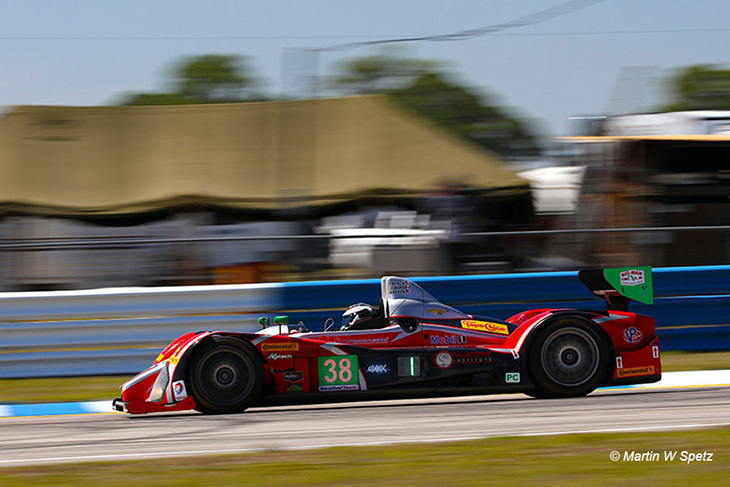 Elsewhere the pole-sitting Rebellion Oreca, ESM Nissans, PR1 Ligier and Visit Florida Riley had recurring mechanical niggles which put them out of the running. 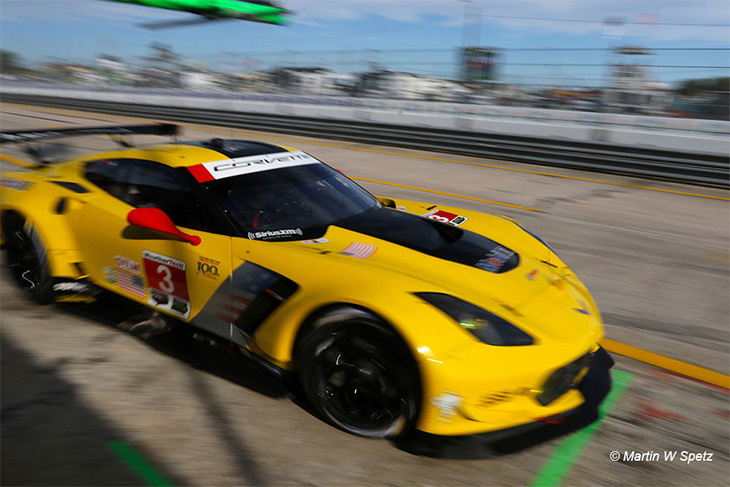 In the GTLM category, Corvette Racing continued its winning streak at Sebring. While the #4 retired after a mechanical failure, the sister #3 Corvette C7.R of Antonio Garcia, Jan Magnussen and Mike Rockefeller making it three straight wins at the big race. 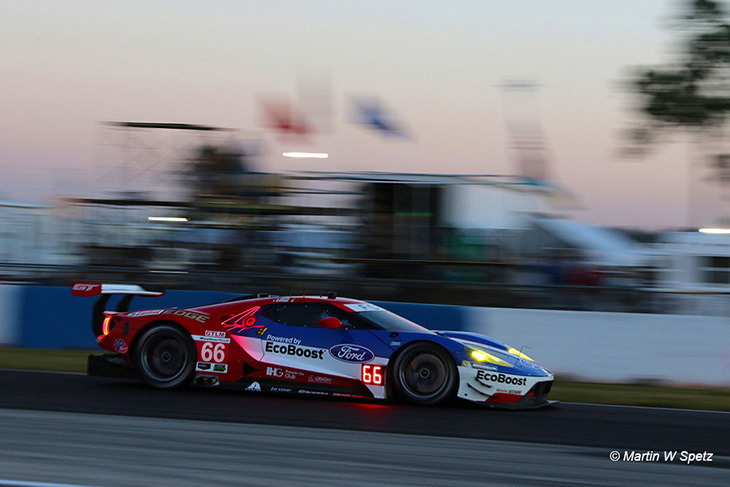 The car took the flag just four seconds ahead of the second place #66 Chip Ganassi Racing Ford GT of Joey Hand, Sebastien Bourdain and Scott Dixon which led much of the race, and seventh overall in the classification. The result will leave Ford disappointed. 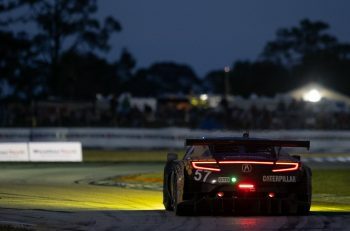 As a team it was dominant in Qualifying and ran in formation at multiple points during the race at the front in its bid to win Le Mans, Daytona and Sebring in nine months. But it wasn’t to be this time for the ‘Blue Oval’. “It’s always frustrating to get second,” Hand said. “We got beat by a car that was just faster at night. It wasn’t from a lack of trying. I threw everything at it. At the risk of running my tires off I went for it and thought that I’d get by and head them off. The battle for the final podium spot after 12 hours of racing was also hard-fought, with James Calado continuing the tradition of last-lap drama at Sebring, promoting Risi Competizione’s Ferrari 488 and teammates Toni Wilander and Giancarlo Fisichella to third after getting past the #67 Ford GT of Richard Westbrook, Ryan Briscoe and Scott Dixon. The WEC-crewed #68 GT of Stefan Mucke, Billy Johnson and Olivier Place meanwhile, rounded out the top five. Further down the order, Porsche looked capable of taking the win after the #911 Porsche 911 RSR of Patrick Pilet, Dirk Werner and Frederic Makowiecki ran in first on multiple occasions. The two cars – the #911 leading the #912 – seventh and eighth in class; BMW meanwhile failed to feature in the race for the win, though its #25 M6 did end up sixth. 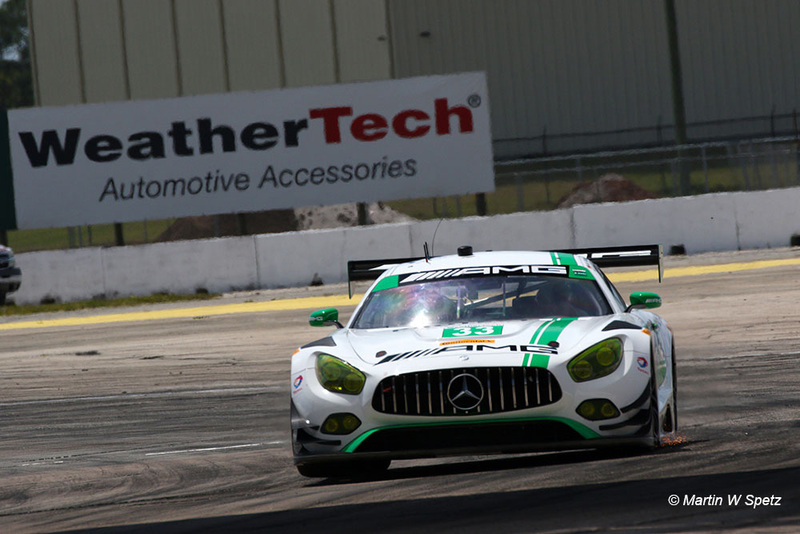 Riley Motorsports scored Mercedes-Benz its first class win at Sebring for 60 years, after the first time Jeroen Bleekemolen, Mario Farnbacher and Ben Keating cruised to the finish a lap clear of the competition. In the end 2016 IMSA GTD champion Scuderia Corsa came home second after another great performance by Alessandro Balzan and Christina Nielsen who for the race were sharing the team’s 488 GT3 with Matteo Cressoni. And the final podium spot went to the SunEnergy 1 AMG GT3 after Frenchman Tristan Vautier charged up the order in the final dash to the flag, climbing from fifth to third. As usual GTD was a close-run affair, with nine cars still on the lead lap in the final stint. Land Motorsport’s Audi R8 again impressed with pace in its run to fourth and Paul Miller Racing’s Lamborghini Huracan made it four marques in the top five. Performance Tech Motorsport scored its second ever PC win and its second in a row, with Patricio O’Ward, Kyle Masson and James French dominating the class for almost the entire race after raking the lead in the second hour. It was one of the better PC races in recent memory however, with clean racing and not as many mechanical troubles hitting the runners. 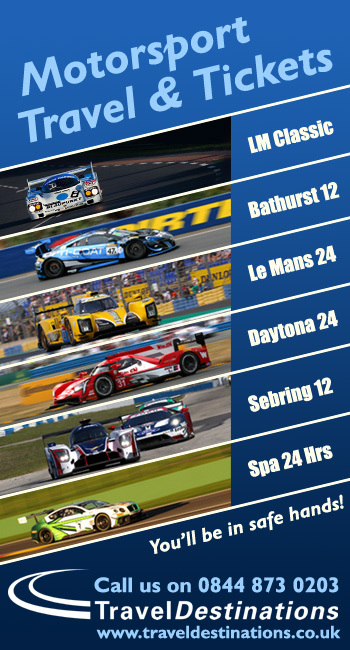 Starworks’ Oreca finished two laps back off the winners, while the #26 BAR 1 FLM09 came home 10 laps down in third.